Before Chrsitmas I had a trip to Housing Units, where I'd discovered they stock Bomb Cosmetics products. I want to sniff before I buy so it's great to find somewhere local that sell's there. 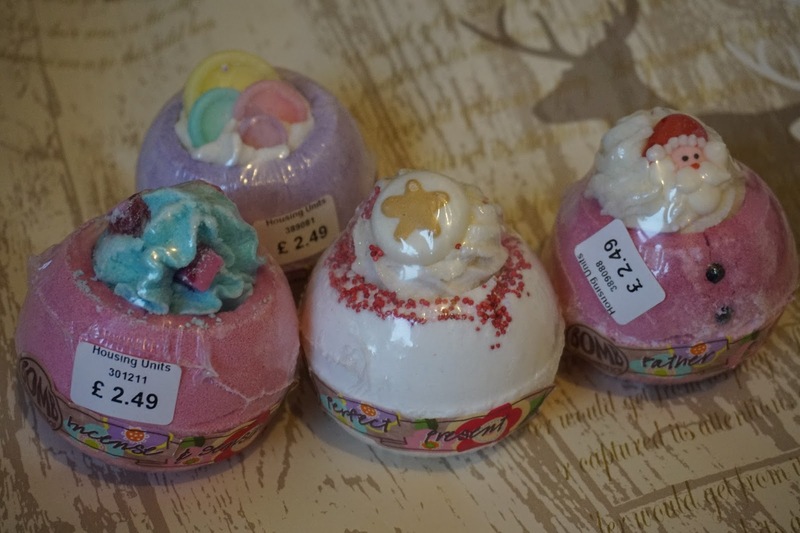 They didn't seem to have the Bath Mallows which are my favourites but I decided to grab 4 bath bombs. I think the price is a little bit more than buying direct from Bomb Cosmetics but I was happy to pay any extra to be able to buy them there and then and not having to order online. All of these smelt lovely and I really enjoyed using them. I especially liked the names. Bombjamen Button really tickled me and and did laugh out loud every time I read the name. The two Christmas themed ones where very nice, I don't enjoy overly spiced smells but these smelt very fresh and they are all quite moisturing which I really liked. I really need another trip to Housing Units to stock back up. I feel like I may have missed out on some good ones as I went to a stand with what I thought were all the Bomb Products but as I was leaving the store I dotted a few around different displays so next time I need to explore the store a little bit more.